Get updates about Luke Redd's art, writing, and music. Find out about upcoming exhibitions. And get the stories behind some of his strangest and boldest works. What is art good for? What is my art good for? Those questions haunt me. I don’t know how to answer them. Not fully. Not in a way that truly encapsulates everything I feel. I know that creating art is good for my own mental health and sense of spirituality. Being able to create—performing that act—is a gift. But what about the end results? What are my paintings good for once I’m through placing strokes of color on them? What is their value? Are they just decorative commodities? I’ve never thought so. And that’s where I’ve struggled. When I look at my work or the work of other artists, I see the expression of something greater than any one artist. I see evidence of invisible currents that connect us to each other and flow into everything else. That may sound crazy or “hippy-dippy,” but it’s what I experience. I don’t just see those connections; I feel them. But in today’s world, competition and separation form the dominant narrative. Barriers are everywhere. We’re encouraged to see individuality as one of the highest ideals. Don’t get me wrong; I value individuality. I just think the pendulum has swung too far in that direction. I think it’s blinded a lot of humanity to another possible reality. We’re interconnected. But we’ve done such a good job of erecting walls and other barriers around ourselves and our “tribes” that it’s easy to miss or deny the clues of our inter-being. Clues like a deep sense that something is wrong. Clues like an internal hunger or void that we try to fill—usually unsuccessfully—with shallow amusements. What does any of this have to do with how I sell my art? Three words: Hunger. Family. Connection. Hunger—physical hunger—is still a major barrier in the lives of many people. It’s one of the consequences of our current paradigm. When any human being struggles to put food on the table, it’s a sign that, collectively, we’ve lost the plot. I want my art to help remove that barrier. I want it to help nourish people so that they have greater freedom to follow their hearts’ desires and be who they really are. Connection is at the heart of it all. We may appear to have separate lives, but our actions have ripple effects that extend farther than we probably want to imagine. We are all a lot closer to each other than we realize. We should celebrate those connections instead of trying to deny them or fence them out. I want my art to help deepen our human connections. I want it to help poke holes in the illusion that we are all separate creatures so that we can imagine a better way forward that serves all of us. That’s why I’m going to experiment with karma pricing and donating my proceeds—beginning with the Okanagan Art Fair on April 8th and 9th in West Kelowna, BC. I’m lucky to not be a starving artist. Since I have a day job with an exceptional employer, I also have the opportunity to try this model. After the Rotary Club of Westbank (the organizer of this event) receives its 10 percent, the remaining 90 percent of my proceeds from each sale will go to either the Lake Country Food Bank or to one or more of the other artists who are displaying work at the event. The choice will be up to each buyer. In addition, for each original painting, you will have the choice of how much to pay. You get to choose what the art is worth to you. I don’t want price to be a barrier to finding good homes for my art. If you connect with a piece, you should have the chance to own it. I will also be selling lithographic prints of my popular John Lennon painting at the event, with $20 from the sale of each one going to the Lake Country Food Bank. Part of my booth at Lake Country ArtWalk 2015. I’m always encouraged by meeting other artists who clearly put their hearts into what they create. And at this year’s Lake Country ArtWalk, I think I felt that more than I have before. Not only because the work of the other artists around me came from a truly authentic place, but also because they ensured that the event didn’t have a competitive atmosphere. On the contrary, nearly every other artist I interacted with displayed a spirit of openness and generosity. It felt like we were all in it together. Which is remarkable when you consider how vulnerable an artist must be in order to share his or her work with thousands of strangers. After all, no matter your talents, you will inevitably be rejected or shown indifference by at least half of the people who walk by your booth. It’s part of the deal. The reality is that people only see the end results of your efforts. Very few ever see the hours or days or weeks or months of work that you may have put into a single piece. They don’t feel the physical aches or experience the sleepless nights or countless moments of doubt that are part of the creative process. And that’s OK. As artists, we are compelled to do it anyway. Art is a spiritual practice. It connects us to the mysterious soup of life and creation. And it usually gives more than it takes—even when that fact might be hard to recognize. Still, it is always rewarding to have your efforts acknowledged. And nobody understands an artist like another artist. I also want to thank my awesome wife, mother-in-law, and Ryan Tooley for providing much-needed help in preparing for the event and assisting with the setup and takedown. And I feel a ton of gratitude for everyone who came out to support me and the other artists. With much love, thank you! "Stranded." 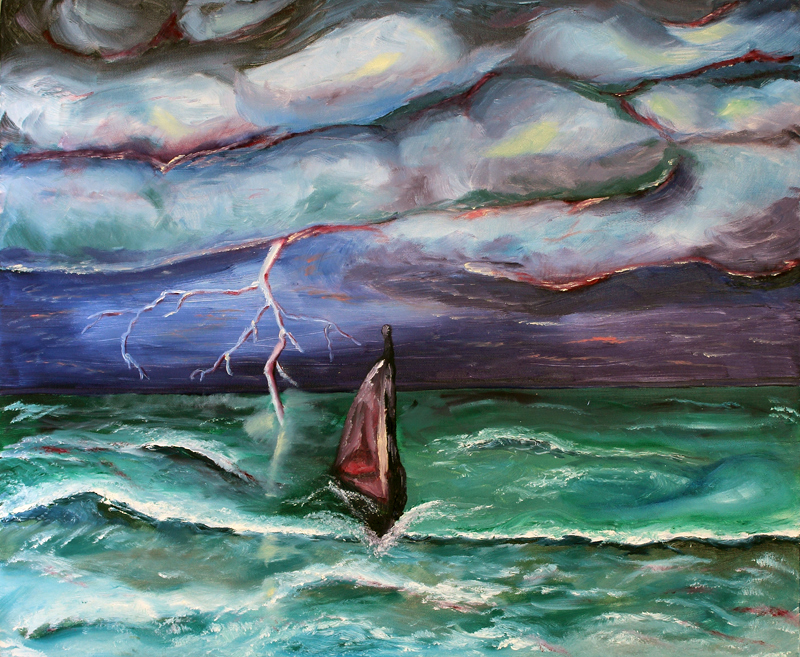 I painted this during college at a time when I was feeling lost in my internal storm of fear. I stumbled upon this TEDTalk by Zak Ebrahim. His father helped plan the first World Trade Center bombing in 1993. That was the year I graduated from high school and started college as a young and naive adult. I remember feeling fear rise in me, along with hatred for whomever was behind the attack. Then, only two years later, the Oklahoma City bombing occurred, and I felt the ugliness taking over me once again. How dare these violent good-for-nothings ruin my sense of peace and hope for the future. How dare they make ME feel this way! Pretty soon, I was able to watch the media gather in front of the federal courthouse in Denver for Timothy McVeigh’s trial. I could see it all from my office window. Again, it all felt like a major encroachment on me. Every day during the trial, I feared I might die as a result of a new bombing by one of McVeigh’s buddies. The building I worked in was right across the street from the courthouse. I felt anger. Paranoia gripped me. And I was starting to hate the human race. But I really tried to look happy and normal. I’m thankful everyday that I got to work side-by-side with my best friend. His humor cut through the darkness and helped me always have at least a partial view of the light so I didn’t get lost. But I was mad at myself for feeling anything ugly at all. After growing up in a state of fear as a result of my boogeyman of a “father,” I thought I had put my paranoia behind me. I really believed I had moved on. Sadly, I realized that I still had more conditioning that needed deprogramming. Honestly, I can’t point to just one thing that kept me from fully succumbing to all of that darkness. But if I had to pick one, it would be the unconditional love I received from my family and friends and even many shallow acquaintances. I guess I chose to pay more attention to the people in my life who demonstrated compassion and generosity than to the people I didn’t know—the “others”—who showed animosity and incivility. Which brings me back to this TEDTalk. I am struck by Zak Ebrahim’s willingness to share his story. It resonates with me especially because of the fact that, like me, he changed his name to end his connection with his father. But it also resonates because I think it shows just how powerful it can be when you consciously choose to let love and acceptance into your heart rather than fear and hatred. Many people on this planet might be compelled to harm others as a misguided way of trying to protect themselves, but Ebrahim’s story shows that there is a better path. And we all have the power to choose it. There comes a time when you must finally be who you really are. My booth at ArtWalk 2014. It was long overdue. After more than 20 years of painting and being shy about showing my work, I went all in. The 2014 Lake Country ArtWalk on September 6th and 7th served as my coming-out-as-a-fine-artist party. But even though I worked very hard to prepare for this annual juried event—the largest of its kind in the British Columbia Interior—I have far more people than myself to thank for getting me there. My beautiful, kind, encouraging wife is really the number one reason I’ve stopped hiding my work. Her emotional support has been huge. Without her, I fear I might have never walked through this door. My incredible family and friends also deserve my sincerest gratitude. My mom, her partner, and my sister—the three other most important women in my life—came up from Colorado to be my minions and extra support. They made the weekend more special than I could have imagined. Of course, the other artists were amazing. But I want to give an especially heartfelt thank you to the talented and delightful Nikki Balfour for her friendliness and generosity. Maud Besson, another gifted painter, was a true gem to meet. And I appreciated the warmth and genuine care from Noëlle Nadeau, Michael Sime, and Norbert Spyth. All in all, ArtWalk was an experience I won’t soon forget. From the tireless volunteers to the Okanagan artists to the thousands of energetic art lovers from all over BC and other places, it was the people which made this an exhibition that I look forward to participating in again. Next up for me: A Night of a Thousand Lights at Kelowna’s Artisan House, September 25th, 26th, and 27th from 7pm to 11pm. Admission is only a $5 donation. Why not come say hi and see a bunch of colorful work from 40 artists under bright lights? I also have a piece on display at the Lake Country Art Gallery until October 3, 2014 as part of the theme exhibition, A Step Forward. Many thanks to Katie Brennan. Artist in Lake Country, British Columbia who loves to paint, rock and roll, and engage in maverick storytelling.